Martha Endell in "David Copperfield"
Martha by Phiz (Hablot K. Browne), 1850. Click on image for larger picture and additional information. Martha Endell, a minor, but vital character in David Copperfield, is not tempted and tricked into sin as Em'ly is. Through Martha, Dickens explores the concept of moral weakness leading to falleness. This is of interest in a society that believed in the natural moral superiority of women. Martha, the 'shadow,' that follows and haunts Em'ly has simply, 'gone wrong'. Isolated and shunned by, 'these streets, where the whole town knows me from a child,' (Oliver Twist, p.290). Martha begs Em'ly to help her get to London. The reaction of the Peggotty family, in some ways the moral measure of this novel, is sympathetic but shows their repugnance to Martha's fall. The illustration shows the weeping and un-bonneted Martha at a distance from the others, alone. Her unkempt appearance is a sure signifier to the reader that here was a young woman with no regard for social mores. The Peggotty's reaction shows their inherent and naive moral superiority, both to other characters in the novel and possibly also the reader. They will help but cannot accept her. Ham says of Martha, 'It's a young woman, sir — a young woman that Em'ly knowed once, and doen't ought to know no more.' ( David Copperfield, p. 288). Em'ly says prophetically that she herself is, 'not as good a girl as I ought to be,' and begs the others to help Martha who, as she says, 'will try to do well' in London. The cause then, of Martha Endell's fall, is her own moral weakness. 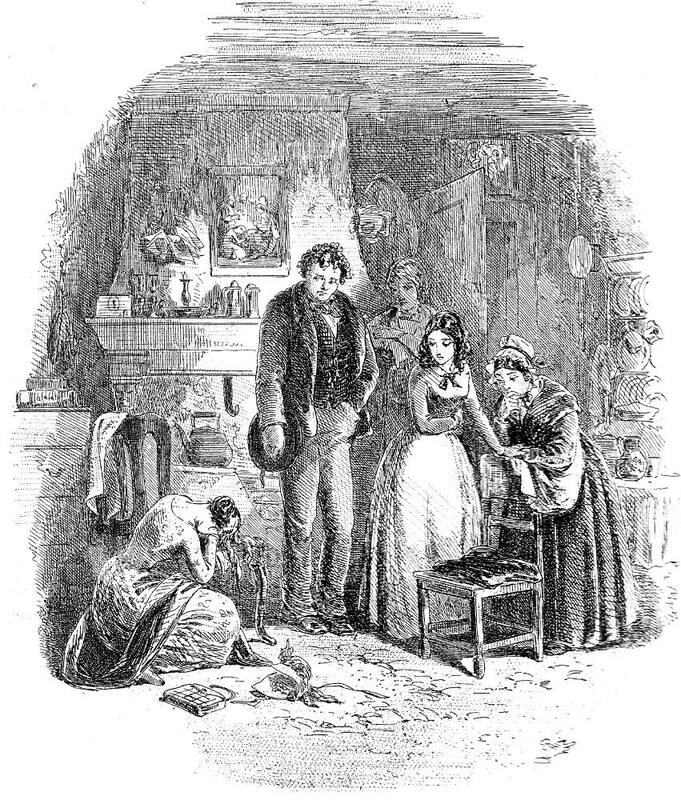 Although at a first reading it may seem that Dickens intends to deal more harshly with Martha in response to her deviance as the plot unfolds we realise that redemption is possible, even for Martha. In a society that felt that women were the guardians of morality, Martha's deviance is doubly shocking. Her unhappiness seems only right and proper and Dickens' readers would have expected it. She is not only a further exploration into the subject of fallenenss by the author but also a convenient plot device. Later in the story Martha leads Mr Peggotty to the unhappy Em'ly, and, the suggestion is, saves her from imminent further shame. Martha though, is saved, possibly to the surprise of contemporary readers but perfectly in tune with Dickens' pragmatic approach to his Urania Cottage inmates. We will return to this at a later point in the article.